The Ojibwa or Chippewa (also Ojibwe, Ojibway, Chippeway) is one of the largest groups of Native Americans-First Nations in North America. They are divided between the United States and Canada. Because they were formerly located mainly around Sault Ste. Marie, at the outlet of Lake Superior, the French referred to them as Saulteurs. Ojibwa who subsequently moved to the prairie provinces of Canada have retained the name Saulteaux. Ojibwa who were originally located about the Mississagi River and made their way to southern Ontario are known as the Mississaugas. They were fearless warriors and, with the use of gun technology from the British, they were able to defeat and push back the Sioux and Fox tribes to become the unchallenged inhabitants of vast areas of the northern plains around the Great Lakes. They are known for their birch bark canoes, sacred birch bark scrolls, the use of cowrie shells, wild rice, copper points. Their Midewiwin Society is well respected as the keeper of detailed and complex scrolls of events, history, songs, maps, memories, stories, geometry, and mathematics. The Ojibwa Nation was the first to set the agenda for signing more detailed treaties with Canada's leaders before many settlers were allowed too far west. They also signed numerous treaties with the United States, seeking to keep at least portions of their ancestral lands to be designated as their reservations and avoiding the tragic relocations of many other tribes. Today, as a major component group of the Anishinaabe peoples—which includes the Algonquin, Nipissing, Oji-Cree, Odawa and the Potawatomi—the Ojibwa peoples number over 100,000 in the U.S., living in an area stretching across the north from Michigan to Montana. Another 76,000, in 125 bands, live in Canada, stretching from western Québec to eastern British Columbia. Despite facing poverty and high levels of unemployment, many contemporary Ojibwa continue to follow traditional ways, both practical and spiritual. They are active in resource management, seeking ways to live in harmony with their environment. from ojiibwabwe (/o/ + /jiibw/ + /abwe/), meaning "those who cook\roast until it puckers," referring to their fire-curing of moccasin seams to make them water-proof (Roy 2008), though some sources instead say this was a method of torture which the Ojibwa implemented upon their enemies (Warren 1984). from ozhibii'iwe (/o/ + /zhibii'/ + /iwe/), meaning "those who keep records [of a Vision]," referring to their form of pictorial writing, and pictographs used in Midewiwin rites (Erdrich 2003). from ojiibwe (/o/ + /jiib/ + /we/), meaning "those who speak-stiffly"\"those who stammer," referring to how the Ojibwa sounded to the Cree (Johnston 2007). The Saulteaux (also Salteaux pronounced [ˈsoʊtoʊ]) are a First Nation in Ontario, Manitoba, Saskatchewan, Alberta, and British Columbia, Canada, and a branch of the Ojibwa. Saulteaux is a French language term meaning "people of the rapids," referring to their former location about Sault Ste. Marie. The Ojibwa/Chippewa are part of the Anishinaabe peoples, together with the Odawa and Algonkin peoples. Anishnaabeg (plural form) means "First- or Original-Peoples" or it may refer to "the good humans," or good people, that are on the right road/path given to them by the Creator or gitchi-manitou (Anishinaabeg term for God). In many Ojibwa communities throughout Canada and the U. S., the more generalized name Anishinaabe(-g) is becoming more commonly used as a self-description. The Ojibwe language is known as Anishinaabemowin or Ojibwemowin, and is still widely spoken. It belongs to the Algonquian linguistic group, and is descended from Proto-Algonquian. Its sister languages include Blackfoot, Cheyenne, Cree, Fox, Menominee, Potawatomi, and Shawnee. Anishinaabemowin is frequently referred to as a "Central Algonquian" language; however, Central Algonquian is an areal grouping rather than a genetic one. Ojibwemowin is the fourth most spoken Native language in North America (after Navajo, Cree, and Inuktitut). Many decades of fur trading with the French established the language as one of the key trade languages of the Great Lakes and the northern Great Plains. The Ojibwa presence was made highly visible among non-Native Americans and around the world by the popularity of the epic poem The Song of Hiawatha, written by Henry Wadsworth Longfellow in 1855. The epic contains many toponyms that originate from Ojibwa words. According to the oral history of the Anishinaabeg and from their recordings in birch bark scrolls, the Ojibwa came from the eastern areas of North America, or Turtle Island (the English language translation of many Native American tribes' name for the continent of North America), and from along the east coast. They traded widely across the continent for thousands of years and knew of the canoe routes west and a land route to the West Coast. When the Anishinaabeg were living on the shores of the "Great Salt Water" (presumably the Atlantic Ocean near the Gulf of St. Lawrence). They were instructed by seven prophets to follow a sacred miigis shell, a whiteshell (cowry) toward the west, until they reached a place where food grew upon the water. They began their migration some time around 950 C.E., stopping at various points along the way, most significantly at Baawitigong, Sault Ste. Marie, where they stayed for a long time, and where two subgroups decided to stay (these became the Potawatomi and Ottawa). Eventually they arrived at the wild rice lands of Minnesota and Wisconsin (wild rice being the food that grew upon the water) and made Mooningwanekaaning minis (Madeline Island: "Island of the yellow-shafted flicker") their new capital. In total, the migration took around five centuries. The first historical mention of the Ojibwa occurs in the Jesuit Relation of 1640 under the name Baouichigouian, known by the French as Sauteurs because of their residence about the Sault de Ste. Marie (Thwaites 1640). In 1642, Raymbaut and Jogues found them at war with a people to their west, probably the Sioux (Hodge 1910). The Ojibwa were described as "equaling in physical appearance the best formed of the Northwest Indians, with the possible exception of the Foxes" and exhibited great determination and courage in their conflicts with their enemies (Hodge 1910). Yet they were friendly toward the French, and although they encountered missionaries Christianity took little hold, due to the power of their indigenous beliefs and their shamans. Through their friendship with the French traders, they were able to obtain guns and thus successfully end their wars with the Sioux and Fox on their west and south. The Sioux were driven out from the Upper Mississippi region, and the Fox were forced down from northern Wisconsin and compelled to ally with the Sauk. By the end of the eighteenth century, the Ojibwa were the nearly unchallenged owners of almost all of present-day Michigan, northern Wisconsin, and Minnesota, including most of the Red River area, together with the entire northern shores of Lakes Huron and Superior on the Canadian side and extending westward to the Turtle Mountains of North Dakota, where they became known as the Plains Ojibwa or Saulteaux. The Ojibwa together with the Ottawa and Potawatomi peoples formed the Council of Three Fires which fought with the Iroquois Confederacy and the Sioux. The Ojibwa expanded eastward, taking over the lands alongside the eastern shores of Lake Huron and Georgian Bay. The Ojibwa allied with the French in the French and Indian War, and with the British in the War of 1812. In the U.S., the government attempted to remove all the Ojibwa to Minnesota west of Mississippi River, culminating in the Sandy Lake Tragedy and several hundred deaths. Through the efforts of Chief Buffalo and popular opinion against Ojibwa removal, the bands east of the Mississippi were allowed to return to permanent reservations on ceded territory. A few families were removed to Kansas as part of the Potawatomi removal. In British North America, the cession of land by treaty or purchase was governed by the Royal Proclamation of 1763, and subsequently most of the land in Upper Canada was ceded to Great Britain. Even with the Jay Treaty signed between the Great Britain and the United States, the newly formed United States did not fully uphold the treaty, causing illegal immigration into Ojibwa and other Native American lands, which culminated in the Northwest Indian War. Subsequently, much of the lands in Ohio, Indiana, Michigan, parts of Illinois and Wisconsin, and northern Minnesota and North Dakota were ceded to the United States. However, provisions were made in many of the land cession treaties to allow for continued hunting, fishing, and gathering of natural resources by the Ojibwa even after the land sales. The Saulteaux were originally settled around Lake Superior and Lake Winnipeg, principally in the Sault Ste. Marie and northern Michigan areas. White Canadians and Americans gradually pushed the tribe westwards to Manitoba, Saskatchewan and Alberta, with one community in British Columbia. Today most of them live in the Interlake, southern part of Manitoba, and in Saskatchewan; because they lived on land ill-suited for European crops, they were able to keep much of their land. In northwestern Ontario, Manitoba, Saskatchewan, and Alberta, the Ojibwa signed the numbered treaties in the nineteenth century. British Columbia had no signed treaties until the late twentieth century. These numbered treaties were some of the most detailed treaties signed for their time. Often, earlier treaties were known as "Peace and Friendship Treaties" to establish community bonds between the Ojibwa and the European settlers. These earlier treaties established the groundwork for cooperative resource sharing between the Ojibwa and the settlers. However, later treaties involving land cessions were seen as territorial advantages for both the United States and Canada, but the land cession terms were often not fully understood by the Ojibwa because of the cultural differences in understanding of the land. For the governments of the US and Canada, land was considered a commodity of value that could be freely bought, owned and sold. For the Ojibwa, land was considered a fully-shared resource, along with air, water and sunlight; the concept of land sales or exclusive ownership of land was foreign to the Ojibwa at the time of the treaty councils. Consequently, legal arguments in treaty-rights and treaty interpretations continue to bring to light the differences in cultural understanding of these treaty terms. Most Ojibwa were of the Woodlands culture, hunter-gatherers who harvested wild rice and maple sugar. They had no salt and so used maple syrup as a preservative to preserve their food (Sultzman 2000). However, the Ojibwa lived across a wide area and adapted to their local environments. The eastern Ojibwa lived a sedentary lifestyle, engaging in fishing, hunting, the farming of maize and squash, and the harvesting of Manoomin (wild rice). The Plains Ojibwa farmed little and were mainly hunters and fishers, adopting the culture of the Plains Indians, hunting buffalo. A third group were known as the "Bungee," a transitional culture between the eastern Woodlands and the western Plains culture. The typical Ojibwa dwelling was the wiigiwaam (wigwam), built either as a waaginogaan (domed-lodge) or as a nasawa'ogaan (pointed-lodge), made of birch bark, juniper bark and willow saplings. They also developed a form of pictorial writing used in religious rites of the Midewiwin and recorded on birch bark scrolls and sometimes on rock. The many complex pictures on the sacred scrolls communicate historical, geometrical, and mathematical knowledge. Ceremonies also used the miigis shell (cowry shell), which is naturally found in far away coastal areas; this fact suggests that there was a vast trade network across the continent at some time. The use and trade of copper across the continent is also proof of a very large area of trading that took place thousands of years ago, as far back as the Hopewell culture. Certain types of rock used for spear and arrow heads were also traded over large distances. 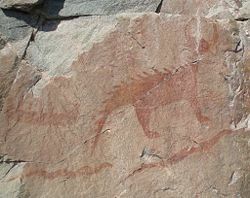 The use of petroforms, petroglyphs, and pictographs was common throughout their traditional territories. Petroforms and medicine wheels were a way to teach the important concepts of four directions, astronomical observations about the seasons, and as a memorizing tool for certain stories and beliefs. The Ojibwa would bury their dead in a burial mound; many erect a jiibegamig or a "spirit-house" over each mound. Instead of a headstone with the deceased's name inscribed upon it, a traditional burial mound would typically have a wooden marker, inscribed with the deceased's doodem. The Ojibwa viewed the world in two types: animate and inanimate, rather than male and female genders. As an animate a person could serve the society as a male-role or a female-role. John Tanner, who spent 30 years living as an Ojibwa after having been kidnapped, documented in his Narrative that Ojibwa peoples do not fall into the European ideas of gender and its gender-roles, having people who fulfill mixed gender roles, two-spirits or egwakwe (Anglicised to "agokwa"). A well-known egwakwe warrior and guide in Minnesota history was Ozaawindib. Tanner described Ozaawindib as "This man was one of those who make themselves women, and are called women by the Indians" (Tanner 2007). The Ojibwa people were divided into a number of odoodeman (clans; singular: odoodem) named primarily for animal totems (doodem). Five original totems were Wawaazisii (Bullhead), Baswenaazhi (Crane), Aan'aawenh (Pintail Duck), Nooke (Bear) and Moozwaanowe ("Little" Moose-tail). The clans had distinct responsibilities that worked together to care for the people, such as chieftainship, a type of police, teachers, spiritual guides, and so forth (Schneider 2003). Traditionally, each band had a self-regulating council consisting of leaders of the communities' clans, with the band often identified by the principle doodem. Ojibwa understanding of kinship is complex, and includes not only the immediate family but also the extended family. It is considered a modified bifurcate merging kinship system. As with any bifurcate merging kinship system, siblings generally share the same term with parallel-cousins, because they are all part of the same clan. Complexity wanes further from the speaker's immediate generation, but some complexity is retained with female relatives. For example, ninooshenh is "my mother's sister" or "my father's sister-in-law"—my parallel-aunt—and also "my parent's female cross-cousin." Great-grandparents and older generations, as well as great-grandchildren and younger generations are collectively called aanikoobijigan. This system of kinship speaks of the nature of the Anishinaabe's philosophy and lifestyle, that is of interconnectedness and balance between all living generations and all generations of the past and of the future. Pictographs of a mishibizhiw ("underwater panther") as well as two snakes and a canoe, attributed to the Ojibwa. From Lake Superior Provincial Park, Ontario, Canada. Before contact with Europeans, Ojibwa religion had little formal ceremony. They relied on shamans for healing by use of medicinal herbs. Contact with Europeans exposed them not just to a different culture but to new diseases against which they had little or no defense. Efforts to deal with sickness evolved into the complex Midewiwin Grand Medicine Society, a secret society whose qualified members performed elaborate ceremonies (Sultzman 2000). The Ojibwa have a number of spiritual beliefs passed down by oral tradition under the Midewiwin teachings. These include a creation myth and a recounting of the origins of ceremonies and rituals. Spiritual beliefs and rituals were very important to the Ojibwa because spirits guided them through life. Birch bark scrolls and petroforms were used to pass along knowledge and information, as well as used for ceremonies. Pictographs were also used for ceremonies. Gichi-manidoo (Gitchi Manitou, Gitche Manito) is the "Great Spirit," God, the Creator of all things and the Giver of Life, sometimes translated as the "Great Mystery." Manitou is an Anishinaabe word for spirit, spiritual, mystery, mysterious, or deity. Historically, Anishinaabe people believed in a variety of spirits, whose images were placed near doorways for protection. With the coming of Christian missionaries and their need to translate the idea of monotheism, Gitche Manitou meaning "Great Spirit" was coined. The term Manitou itself refers to the concept of one aspect of the interconnection and balance of nature/life; in simpler terms it can refer to a spirit. This spirit is seen as a (contactable) person as well as a concept. Everything has its own manitou—every plant, every stone and even machines. These Manitous do not exist in a hierarchy like European gods/goddesses, but are more akin to one part of the body interacting with another and the spirit of everything; the collective is named Gitche Manitou. Nanabozho (also known by a variety of other names and spellings, including Wenabozho, Menabozho, and Nanabush) figures prominently in Anishinaabe storytelling, including the story of the world's creation. Nanabozho is the Ojibwa trickster figure and culture hero (these two archetypes are often combined into a single figure in First Nations mythologies). He was the son of Wiininwaa ("Nourishment"), a human mother, and E-bangishimog ("In the West"), a spirit father. He was sent to Earth in the form of a rabbit by Gitchi Manitou to teach the Ojibwa, and one of his first tasks was to name all the plants and animals. Nanabozho is considered to be the founder of Midewiwin. He features as the protagonist of a cycle of stories that serve as the Anishinaabe origin myth. The cycle, which varies somewhat from community to community, tells the story of Nanabozho's conception, birth, and his ensuing adventures, which involve interactions with spirit and animal beings, the creation of the Earth, and the establishment of the Midewiwin. The myth cycle explains the origin of several traditions, including mourning customs, beliefs about the afterlife, and the creation of the sacred plant asemaa (tobacco). Bagwajiwininiwag is Anishinaabe for Bigfoot or Sasquatch, literally meaning "Wildmen" or "Wildernessmen." In the aadizookaan, they represent honesty. E-bangishimog is the west wind, manidoo of ultimate destiny. E-bangishimog's children include Majiikiwis, Jiibayaabooz, and Nanabozho. Jiibayaabooz is a "Spirit Rabbit" who taught methods of communication with the manidoog through dreams, vision quests, and purification ceremonies. He is the "Chief of the Underworld." Nibiinaabewag/niibinaabekwewag ("Watermen"/"Waterman-women," singular nibiinaabe/nibiinaabekwe) are mermen and mermaids. Nookomis (the "Grandmother") is the Earth-Mother, the one from whom is derived the Water of Life, who feeds plants, animals, and men. She is also known as Ogashiinan ("Dearest Mother"), Omizakamigokwe ("Throughout the Earth Woman") or Giizhigookwe ("Sky Woman"). Wiindigoog (singular wiindigoo, Anglicized to Wendigo) are giant, powerful, malevolent cannibalistic spirits associated with the Winter and the North. If a human ever resorts to cannibalism to survive, they are said to become possessed by the spirit of a wiindigoo, and develop an overpowering desire for more human flesh. Wiininwaa ("Nourishment") is a woman who became immortal through manidoowiziwin (the process of taking on qualities of a Manitou). She is the daughter of Nookomis and mother of Nanabozho. According to the oral history, seven great miigis (radiant/iridescent) beings appeared to the peoples in the Waabanakiing (Land of the Dawn or Eastern Land) to teach the peoples of the mide way of life. However, one of the seven great miigis beings was too spiritually powerful and killed the peoples in the Waabanakiing when the people were in its presence. The six great miigis beings remained to teach while the one returned into the ocean. The six great miigis beings then established doodem (clans) for the peoples in the east. Then these six miigis beings returned into the ocean as well. If the seventh miigis being stayed, it would have established the Thunderbird doodem. At a later time, one of these miigis beings appeared in a vision to relate a prophecy. The prophecy stated that if more of the Anishinaabeg did not move further west, they would not be able to keep their traditional ways alive because of the many new settlements and European immigrants that would arrive soon in the east. Their migration path would be symbolized by a series of smaller Turtle Islands, which was confirmed with miigis shells (cowry shells). After receiving assurance from the their "Allied Brothers" (Mi'kmaq) and "Father" (Abnaki) of their safety in having many more of the Anishinaabeg move inland, they advanced along the St. Lawrence River to the Ottawa River to Lake Nipissing, and then to the Great Lakes. First of these smaller Turtle Islands was Mooniyaa, which Mooniyaang (Montreal, Quebec) now stands. The "second stopping place" was in the vicinity of the Wayaanag-gakaabikaa (Concave Waterfalls, Niagara Falls). At their "third stopping place" near the present-day city of Detroit, Michigan, the Anishinaabeg divided into six divisions, of which the Ojibwa was one of these six. The first significant new Ojibwa culture-center was their "fourth stopping place" on Manidoo Minising (Manitoulin Island). Their first new political-centre was referred as their "fifth stopping place," in their present country at Baawiting (Sault Ste. Marie). Continuing their westward expansion, the Ojibwa divided into the "northern branch" following the north shore of Lake Superior, and "southern branch" following the south shore of the same lake. In their expansion westward, the "northern branch" divided into a "westerly group" and a "southerly group." The "southern branch" and the "southerly group" of the "northern branch" came together at their "sixth stopping place" on Spirit Island located in the St. Louis River estuary of Duluth/Superior region where the people were directed by the miigis being in a vision to go to the "place where there is food (wild rice) upon the waters." Their second major settlement, referred as their "seventh stopping place," was at Shaugawaumikong (or Zhaagawaamikong, French, Chequamegon) on the southern shore of Lake Superior, near the present La Pointe near Bayfield, Wisconsin. The "westerly group" of the "northern branch" continued their westward expansion along the Rainy River, Red River of the North, and across the northern Great Plains until reaching the Pacific Northwest. Along their migration to the west they came across many miigis, or cowry shells, as told in the prophecy. The Ojibwa also have a story of a Great Deluge that has been passed down from generation to generation over the centuries. They tell of a time long ago when the Anishinaabeg began to argue amongst themselves and lost respect for all living creatures. The Creator, Gichi Manidoo, saw this situation and brought a great flood on the earth, killing almost every person and living thing. This punishment is a lesson that has guided Ojibwa lifestyle, teaching them to live in harmony with all creation (Cubie 2007). Objects like drums, pipes, and tobacco play significant roles in ceremonies. A drum represents the "circle of life" and must undergo a special ceremony before it can be used to heal and unify people (Schneider 2003). Asemaa (Tobacco) represents east. Though pure tobacco is commonly used today, traditionally "kinnikinnick"—a giniginige ("mixture") of primarily red osier dogwood with bearberry and tobacco, and occasionally with other additional medicinal plants—was used. The tobacco or its mixture is used in the offering of prayer, acting as a medium for communication. It is either offered through the fire so the smoke can lift the prayers to the Gichi-manidoo, or it is set on the ground in a clean place as an offering. This is done on a daily basis as each new day is greeted with prayers of thankfulness. Tobacco is also the customary offering when seeking knowledge or advice from an Elder or when a Pipe is present. A dreamcatcher (or dream catcher; Ojibwe asabikeshiinh, is a handmade object based on a willow hoop. Traditionally, the Ojibwa construct dreamcatchers by tying sinew strands in a web around a small round or tear-shaped frame (in a way roughly similar to their method for making snowshoe webbing). 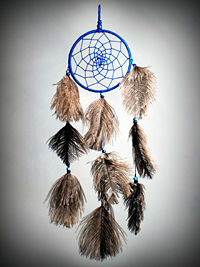 The dreamcatcher is decorated with personal and sacred items such as feathers and beads. The resulting "dream-catcher," hung above the bed, is then used to protect sleeping children from nightmares. The Ojibwa believe that a dreamcatcher filters a person's dreams: Only good dreams would be allowed to filter through; bad dreams would stay in the net, disappearing with the light of day (Andrews 1997). The "jingle dress" is a dance dress worn by women participating in the "Jingle Dress Dance" at a Pow wow. Made of cloth, the dress includes several rows of metal cones, which are sewn across the dress on the skirt (and blouse, in some areas). The metal cones create a jingling sound as the dancer moves. The Jingle Dress Dance is characterized by light footwork danced close to the ground. The dancer dances in a snake-like pattern around the drum; her feet never cross, nor does she dance backward or turn a complete circle. The jingle dress is considered a healing dress. Its origin is attributed to several Ojibwa communities in which a vivid recurring dream was experienced. The dream came to a Midewinini, a medicine-man or shaman. In the dream there were four women, each wearing a jingle dress and dancing. The dream also gave instructions on how to make the dresses, what types of songs went with them, and how the dance was to be performed. The story continues that the reason for this recurring dream was because the daughter (in some versions the grand-daughter) of the Midewinini was gravely ill. When the dance was performed in the presence of the child, in the way shown in the dream, the child recovered. This happened around 1900 and spread throughout Ojibwa reservations. In the late 1920s, the jingle dress was given to the Lakota and it spread westward into the Dakotas and Montana. Ancient Ojibwa tradition: The Snowshoe Dance, performed at the first snowfall every year since time immemorial, by George Catlin 1835. Every year at the first snow, a traditional Snowshoe dance is performed. This dance celebrates the coming of the snow, an essential part of the cycle of life for which they give thanks, and also reminds them of the necessity for snowshoes to aid them in traveling through snow in order to hunt and they dance in hope of a successful hunt and thus to survive the winter. The snowshoe dance was performed around a tall pole with a pair of snowshoes suspended from the top. The snow-shoe dance … is exceedingly picturesque, being danced with the snow shoes under the feet, at the falling of the first snow in the beginning of winter, when they sing a song of thanksgiving to the Great Spirit for sending them a return of snow, when they can run on their snow shoes in their valued hunts, and easily take the game for their food (Catlin 1995). Sweat lodges are very important in Ojibwa spiritual life. A visit to the sweat lodge cleanses both the body and spirit. Supported by fasting and meditation, the sweat lodge is a place to receive guidance on how to live one's life in accord with the spirits (Schneider 2003). 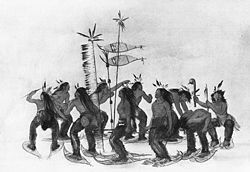 The Sun Dance (known as the Rain Dance among the Saulteaux) is a ceremony practiced by a number of Native Americans, particularly the Plains Indians. There are distinct rituals and methods of performing the dance, but they generally include dancing, singing, praying, drumming, the experience of visions, fasting, and in some cases piercing of the chest or back. Most notable for early Western observers was the piercing many young men endure as part of the ritual. The object of being pierced is to sacrifice one's self to the Great Spirit, and to pray while connected to the Tree of Life, a direct connection to the Great Spirit. Breaking from the piercing is done in one moment, as the man runs backwards from the tree at a time specified by the leader of the dance. The Government of Canada officially persecuted Sun Dance practitioners and attempted to suppress the Sun Dance on many Canadian plains reserves starting in 1882 until the 1940s. The flesh-sacrifice and gift-giving features were legally outlawed in 1895. Despite the subjugation, Sun Dance practitioners, including Saulteaux, continued to hold Sun Dances throughout the persecution period, minus the prohibited features. At least one Cree or Saulteaux Rain Dance has occurred each year since 1880 somewhere on the Canadian Plains. In 1951 government officials revamped the Indian Act and dropped the legislation that forbade flesh-sacrificing and gift-giving (Pettipas 1994). Contemporary Ojibwa still use the sweat lodge during important ceremonies and to pass along their oral history. Teaching lodges are common to teach the next generations about the language and ancient ways of the past. Many people still follow the traditional ways of harvesting wild rice, picking berries, hunting, making medicines, and making maple sugar. Many of the Ojibwa take part in sun dance ceremonies across the continent. Several Ojibwa bands in the United States cooperate in the Great Lakes Indian Fish & Wildlife Commission, which manages their treaty hunting and fishing rights in the Lake Superior-Lake Michigan areas. The commission follows the directives of U.S. agencies to run several wilderness areas. Some Minnesota Ojibwa tribal councils cooperate in the 1854 Treaty Authority, which manages their treaty hunting and fishing rights in the Arrowhead Region. In Michigan, the Chippewa-Ottawa Resource Authority manages the hunting, fishing and gathering rights about Sault Ste. Marie, and the waters of Lake Michigan and Lake Huron. In Canada, the Grand Council of Treaty #3 manages the Treaty 3 hunting and fishing rights around Lake of the Woods. Members of the Red Lake Band of Ojibwa in northern Minnesota are making efforts to live in harmony with their land, restoring fisheries, and enhancing wetlands and other wildlife habitats. Despite facing poverty and high levels of unemployment on their reservation, tribal members support these conservation efforts. Although their lifestyle has changed significantly, the traditional "ricing" practice is being restored in the belief that it helps both people and wildlife, bringing a greater balance to life. When gathering rice in the traditional way they knock some grains back into the lake to sustain future harvests, as well as leaving others on the plants as food for birds. A commercial wild rice farm now offers income and also the habitat needed for both waterfowl and shorebirds (Cubie 2007). Ojibwa people have achieved much in many walks of life—from the chiefs of old to more recent artists, scholars, sportsmen, and activists. The following are a few examples. Dennis Banks, a Native American leader, teacher, lecturer, activist and author, was born on Leech Lake Indian Reservation in northern Minnesota. In 1968 he co-founded the American Indian Movement (AIM), an activist group that works for Indian rights both on and off the reservations. In addition to protecting the traditional ways of Indian people, engaging in legal cases protecting treaty rights of Natives, such as hunting and fishing, trapping, and wild rice farming, the organization has a large number of urban Indian members who live and work in large cities and whose rights the organization also defends. James Bartleman grew up in the Muskoka town of Port Carling, a member of the Chippewas of Mnjikaning First Nation. A Canadian diplomat and author, he served as the 27th Lieutenant-Governor of Ontario from 2002 to 2007. Carl Beam (1943-2005), (born Carl Edward Migwans) made Canadian art history as the first artist of Native ancestry to have his work purchased by the National Gallery of Canada as Contemporary Art. His mother, Barbara Migwans was the Ojibwa daughter of Dominic Migwans who was then the Chief of the Ojibways of West Bay and his father, Edward Cooper, was an American soldier. Chief Buffalo (Ojibwe: Ke-che-waish-ke/Gichi-weshkiinh – "Great-renewer" or Peezhickee/Bizhiki – "Buffalo"; also French, Le Beouf) was an Ojibwa leader born at La Pointe in the Apostle Islands group of Lake Superior, in what is now northern Wisconsin. Recognized as the principal chief of the Lake Superior Chippewa for nearly a half-century until his death in 1855, he led his nation into a treaty relationship with the United States Government. He was also instrumental in resisting the efforts of the United States to remove the Chippewa and in securing permanent reservations for his people near Lake Superior. Hanging Cloud (Ojibwa name Ah-shah-way-gee-she-go-qua (Aazhawigiizhigokwe in the contemporary spelling), meaning "Goes Across the Sky Woman") was an Ojibwa woman who was a full warrior (ogichidaakwe in Ojibwe) among her people. Karen Louise Erdrich, author of novels, poetry, and children's books, continued the Ojibwa tradition of self-expression in her writings. Winona LaDuke, activist, environmentalist, economist, and writer, ran for election to the office of Vice President of the United States in 1996 and 2000 as the nominee of the United States Green Party, on the ticket headed by Ralph Nader. Ted Nolan, born on the Garden River Ojibwa First Nation Reserve outside of Sault Ste. Marie, Ontario, Canada served as Head Coach of the Buffalo Sabres and New York Islanders after retirement as a Canadian professional hockey Left Winger. He played three seasons in the National Hockey League for the Detroit Red Wings and Pittsburgh Penguins. O-zaw-wen-dib or Ozaawindib, "Yellow Head" in English) was an Ojibwa warrior who lived in the early nineteenth century and was described as an egwakwe ("agokwa" in literature) or two-spirit—a man who dressed and acted as a woman. Keewaydinoquay Pakawakuk Peschel was a scholar, ethnobotanist, herbalist, medicine woman, teacher, and author. She was an Anishinaabeg Elder of the Crane Clan, born in Michigan around 1919 and spent time on Garden Island, Michigan, a traditional Anishinaabeg homeland. Keith Secola, an award-winning figure in contemporary Native American music, an Ojibwa originally from Minnesota and graduated from the University of Minnesota with a degree in American Indian Studies. Gerald Vizenor, an enrolled member of the Minnesota Chippewa Tribe, White Earth Reservation, one of the most prolific Native American writers with over 25 books to his name, he also taught for many years at the University of California, Berkeley, where he was Director of Native American Studies. Andrews, Terri J. 1997. Living By The Dream. The Turquoise Butterfly Press. Retrieved October 28, 2008. Cubie, Doreen. 2007. Restoring a Lost Legacy. National Wildlife 45(4): 39-45. Retrieved October 30, 2008. Hlady, Walter M. 1961. Indian Migrations in Manitoba and the West. Manitoba Historical Society Transactions, Series 3. Retrieved October 30, 2008. Hodge, Frederick Webb. 2003. Chippewa. Handbook of American Indians North of Mexico. ISBN 1582187487. Digital Scanning Inc. Retrieved October 30, 2008. Roy, Loriene. 2008. Ojibwa. Multicultural America. Retrieved October 29, 2008. Schneider, Karoline. 2003. The Culture and Language of the Minnesota Ojibwe: An Introduction. Kee's Ojibwe page. Retrieved October 30, 2008. Sultzman, Lee. 2000. Ojibwe History. First Nations Histories. Retrieved October 30, 2008. Thwaites, Reuben Gold, ed. 1898. Hurons and Québec. The Jesuit Relations and Allied Documents: Travels and Explorations of the Jesuit Missionaries in New France 1610—1791 Vol. XVIII. Cleveland, OH: The Burrows Brothers. Computerized transcription by Tomasz Mentrak. Retrieved November 5, 2008. Ojibwe Song Pictures, recorded by Frances Desmore circa 1907. This page was last modified on 18 December 2018, at 15:32.